What's the insider's scoop on getting a better triceps workout? Start here with these key tips for arm building. One of my bosses at the Bodybuilding.com office had an article idea he wanted to run by me. (We'll call him John.) John had his physique assessed by a renowned trainer and suggested we do an article on what he needed to do to fix it. John's problem: His arms were too large and muscular. Let's say it together: poooooooor John. I mean, isn't that a problem we can all identify with? Raise your hand if you're in the same boat as John. Just what I thought—it's a pretty empty vessel. An insider's piece on how to make your arms shrink; yeah, that's perfect for our Bodybuilding.com audience. All sarcasm aside, John's issue is a real one (for him), but instead I thought more of our readers would appreciate a piece on the flip side of the coin: how to bring up their triceps. While John may not be getting his article (and I'm probably not getting my bonus), I bring you the 11 rules to abide by—we'll call them laws—during triceps training. If your triceps are lagging, one easy fix is to train them twice over the course of your split (assuming your split is at least 4-5 days in length). The triceps are a small muscle group that recovers fairly quickly. Consider doing triceps after chest—they're an assistance muscle in chest-pressing motions, so you might as well go ahead and finish them off. You can also train triceps on a day separate from chest, either by themselves or with biceps. When you do triceps without training a larger muscle group beforehand, they won't be prefatigued, so you'll be able to push some impressive weights. Just be careful when you're setting up your split so you're not doing triceps on consecutive days. Chest/triceps on Mondays, shoulders on Tuesdays, and bi's/tri's on Wednesdays doesn't build in ample recovery time and can lead to excessive soreness. Devise your split so that at least 48 hours separates workouts for the same muscle group. Devise your split so that at least 48 hours separates workouts for the same muscle group. Warm-up movements aside, nothing is more cringe-worthy than seeing someone start his triceps workout with press-downs—or worse, reverse-grip press-downs. Why the judgment? If your goal is bigger arms, you want to start your routine with the exercises with which you can push the most weight. That's why you should start your leg workout with squats and chest with bench presses. As a rule, those exercises are multijoint moves. Because more than a single set of joints are working, you're recruiting more muscle mass. As a result, you can lift more weight. Among triceps exercises, various types of dips and close-grip bench presses qualify as multijoint. It's better to do those moves early in your workout when your energy levels are higher, rather than waiting till you're fatigued later on. Bottom line: If your first exercise is one in which you can't push much weight, save it for the end of your session. If you're doing triceps after chest, know that they're already pretty fatigued. They've played an active role in all those presses from any angle. While you might not be able to go as heavy with triceps, you can still knock the smithereens out of 'em. One challenging way is to finish them off with just a single exercise. While that may not sound like much of a challenge, the protocol here combines both rest/pause and dropsets for an incredible triceps pump. This technique works only if you've done a heavy chest workout first, so your triceps will already be fatigued. Choose one exercise; for our purposes we'll do the rope press-down. You'll be doing the movement for 10 minutes straight. Choose a weight in which you can do about 10 reps, and do you first set for as many reps as you can. Return the weight to the stack at failure, and after only a 20-second rest interval, do another set—as many as you can. Keep alternating work/rest segments; once you can't reach 8 repetitions, reduce the poundage by one plate on your next set. Your reps will balloon back up a bit, but the short rest intervals quickly induce fatigue as your reps start to fall on successive sets. Keep this up for 10 minutes straight; your arms will be thoroughly pumped—and you'll have a newfound muscle soreness for the next day or two. For more on how to use this technique, read "Finishing Moves: Torching Triceps." While all triceps moves involve elbow extension, you can emphasize (not isolate) a particular head by changing arm position. Let's start by focusing on the long head, which is on the innermost side of the triceps. What you need to know about this muscle is that it attaches above the shoulder joint. While that may seem like no big deal, to work it you have to position your arm or arms overhead. Only in this position can it fully stretch, and a muscle that's fully stretched first is capable of a stronger contraction. 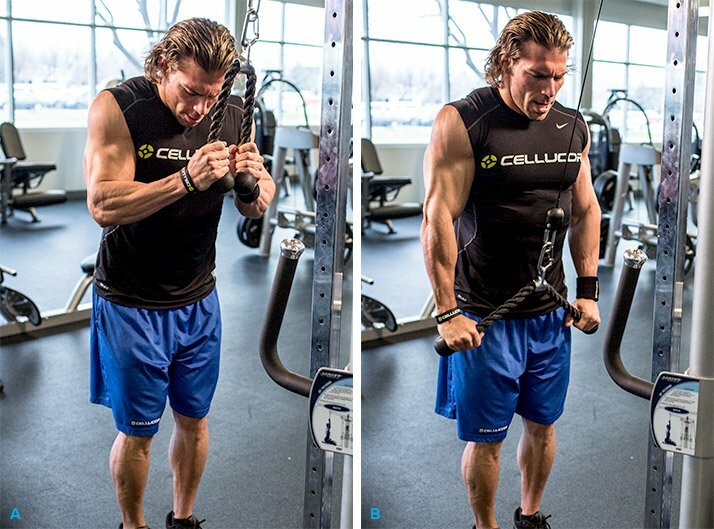 Overhead triceps movements done with EZ-bars, dumbbells, or cables all directly emphasize the long head. Including an overhead movement in each triceps workout therefore ensures you're targeting the long head for growth and maximizing arm girth. Or you can do all overhead movements for a change of pace to really smack the long head for maximal stimulation. Bring your arms down to your sides, as you would for press-downs, and the emphasis shifts to the lateral head of the triceps, which is the outermost head. 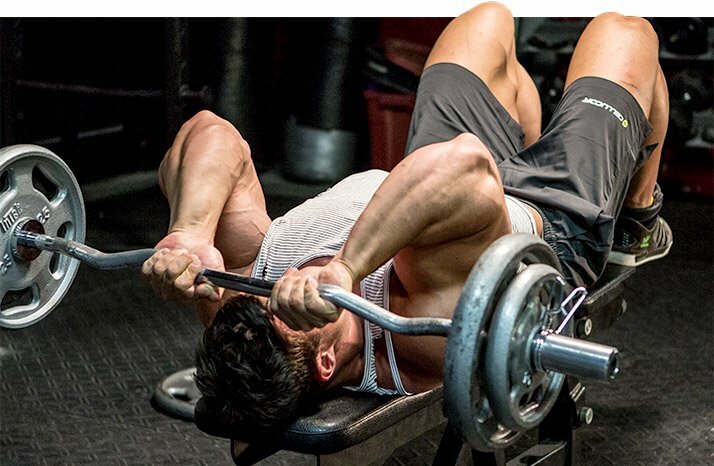 The lateral head also gets a lot of work when doing close-grip benches and bench dips, as well as triceps dip machines, kickbacks, and skullcrushers. Fast Acting Protein Powder to Build Muscle! Go Now! The medial head is the smallest of the three triceps heads. It stabilizes the elbow joint and is involved to some degree in all triceps movements. While you can't isolate it, you can emphasize it by using a reverse grip. Whether it's on press-downs, close-grip benches, or lying extensions, simply turn your hands over from your normal grip. Be forewarned: You won't be able to use much weight, so this kind of exercise is best done near the end of your triceps routine. Whether you're doing press-downs, overhead extensions, dips, close-grip benches, or skullcrushers, keep your elbows in tight rather than allowing them to flare out. Often this is easier said than done. When your elbows flare out, your other muscle groups—namely the chest and shoulders—join in, reducing the effectiveness of the exercise. Keep those elbows in tight! Keep your elbows in tight rather than allowing them to flare out. When doing close-grip bench presses, don't use a grip that's too close. Besides making it harder to balance, an extremely close grip also puts more pressure on your wrists. What's more, closer doesn't mean that any more emphasis is placed on the triceps, either. When doing this movement, keep your hands about 8 inches apart, just inside shoulder width. You'll find it stresses the wrists less and you'll be better able to balance the bar. One of the easiest supersets you can put together involves the skullcrusher and close-grip bench press. With just a flat bench and loaded EZ-bar, start with the skullcrusher. When you reach failure, go right into a set of close-grip benches. Because the former is a single-joint exercise and the latter is a multijoint move, your pec muscles will help kick in to help you pound out those reps at the end of the exercise pairing. For a slightly different feel, try the superset on a slightly inclined or declined bench, which shifts the emphasis just slightly. Dumbbell and cable kick-backs are a common triceps exercise, yet they're often done incorrectly. Here's what to watch for: the elbow. Keep your working-side elbow pinned by your side; don't allow it to drop on the negative rep and then raise back up as you compete the positive. Doing so turns a simple single-joint movement that targets the triceps lateral head into a multijoint one that now involves the shoulders. If you lock your elbow by your side, the joint serves as a hinge. No other movement should be taking place. Dips are a multijoint movement, but how can you do them to emphasize the triceps over the chest? That's easy. Keep your body as vertical as possible—don't lean forward and don't bring your feet up—and, as cited in law 7, keep your elbows in as tight as possible. If you want to train in the muscle-building rep range of 8-12, you might have to use added weight if you're pretty strong doing these. Otherwise, do them toward the end of your workout when you're highly fatigued. Check out Cellucor's complete supplement lineup! Go Now!